Whether it is the sea, the sand, the sun or the softball field, summer brings people outside and this creates exposure to a multitude of potential dangers to the eyes. One risk that is possibly the least obvious is the swimming pool. Swimming pools are the culprit for multitudes of eye infections, irritations and sunburns each year. Here are 3 tips for keeping your eyes safe in and around the swimming pool. Sunlight reflects off water, sand and even cement, increasing exposure. Any time you are in the vicinity of a water source keep your eyes covered with 100% UV blocking sunglasses and a wide brimmed hat. Start this habit early. UV radiation builds up over your lifetime and has been linked to eye diseases such as cataracts and macular-degeneration in adults. Additionally, even short amounts of exposure to intense sunlight can lead to a sunburn of the eye or photokeratitis (see below for treatment), which can be painful and affect vision temporarily. Contact lenses can trap bacteria and microscopic organisms found in water inside your eye resulting in eye infections and irritation. Further, if contacts are worn underwater, they might fall off if you open your eyes. Lastly, there is risk that chlorine or other contaminants will bind onto the contact lens, and certain chemicals cannot be cleaned off or disinfected properly. The best solution is to wear non-prescription swimming goggles over your lenses to keep water and harmful organisms out of your eyes. Prescription goggles are also available for those who prefer to remove their contacts. If you must swim with contact lenses, remove them immediately after you leave the pool and discard or disinfect them thoroughly. It’s preferable to use 1-day disposable contact lenses during water activities, to reduce risk of water contaminating the contacts. Daily disposable lenses allow you to discard the lenses immediately after leaving the water and to start with a fresh lens. Swimming goggles are a good idea even for those who have no vision problems. 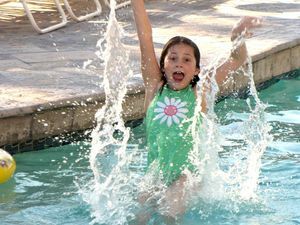 They protect your eyes from the organisms in the water and from chemical irritants such as chlorine and yes, even urine, which are often found in pools. Your eyes will feel much better after swimming if they haven’t been exposed to the water. The cornea at the front of the eye can develop a sunburn from extensive exposure to UV radiation. You can tell you have sunburned eyes when the white of the eye becomes bloodshot and your eyes are sensitive to light and have a gritty feeling (like there is sand in your eye). They may also become sore and sometimes you may experience blurred vision. If you are experiencing discomfort it may help to soothe your eyes with lubricating eye drops, to rest and to stay out of sunlight as much as possible. Sometimes anti-inflammatory eye drops may be required. Usually the symptoms will resolve themselves within a couple of days. If your symptoms persist longer than two days or worsen, visit your eye doctor immediately. Avoid eye sunburns and the cumulative effects of the sun on your precious eyes by always wearing 100% UV blocking sunglasses – rain or shine!